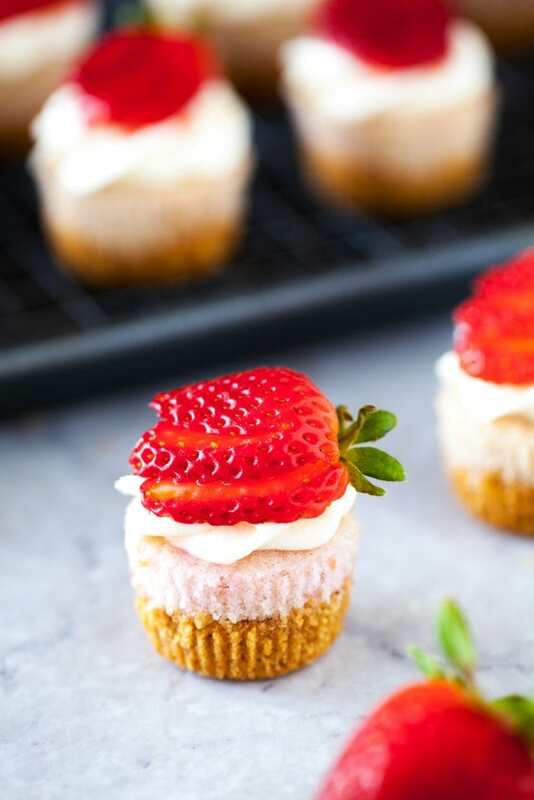 Aren’t these strawberry cheesecake mini cupcakes just the most precious things EVER? Almost too pretty to eat. Almost. 🙂 This recipe is lightly adapted from the Sprinkles cookbook and BOY did it turn out perfect. I know it looks like you need a lot of ingredients. I’m someone that is used to baking with a box of cake, a few eggs, and oil. But TRUST ME – the flavors are THERE. It’s worth an afternoon in the kitchen. Your guests and your tastebuds will thank you. 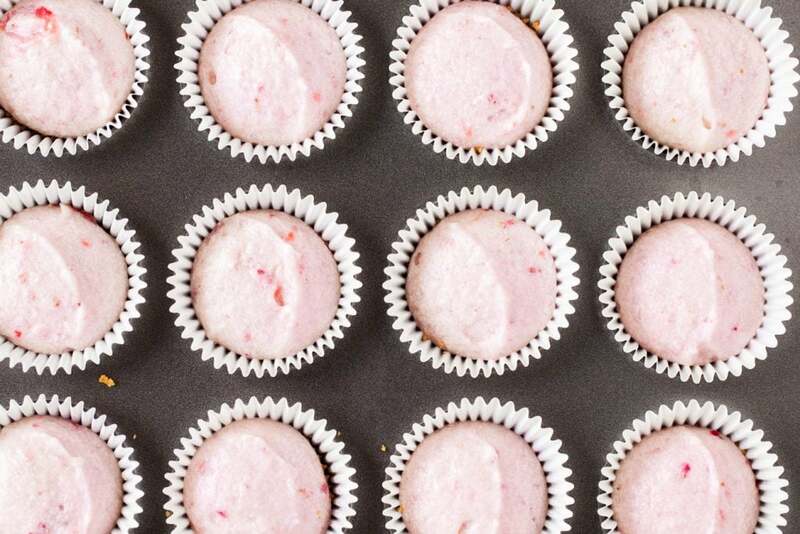 Preheat oven to 350F and line a 12-cup mini cupcake pan. In a food processor, pulse the graham crackers until uniform crumbs form. Transfer to a bowl and add the butter. Stir together until all the crumbs are moistened and resembles wet sand. 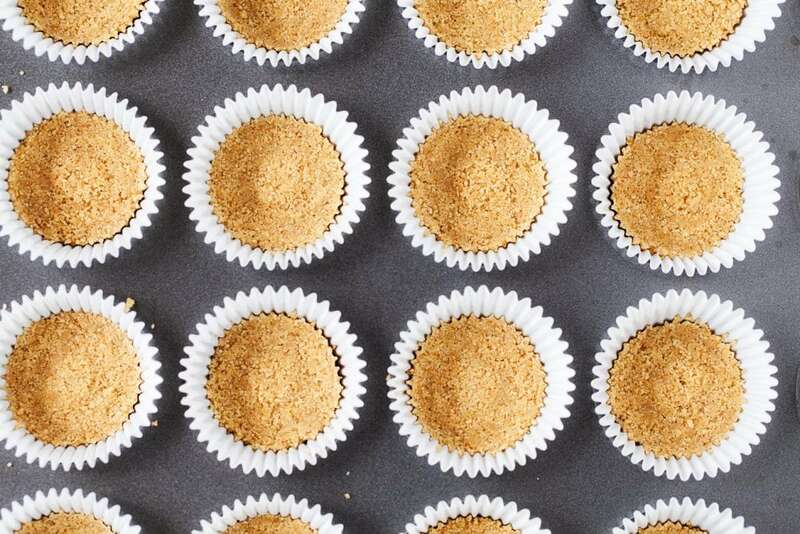 Add 1 tablespoon of the graham crumbs to each cupcake well and press down using the back of a spoon or small glass to compress and tighten. Bake for 6 minutes. Remove from oven and set aside to cool. Add the strawberries to a food processor and pulse until pureed. Transfer to a small bowl and stir in the milk and vanilla. Set aside. In the bowl of a stand mixer fitted with the paddle attachment, cream together the butter and sugar on medium speed. Beat until light and fluffy. Scrape down the bowl, reduce the speed to medium-low and add the egg and white, one at a time. Scrape down the bowl and reduce the speed to low. Add about a third of the flour mixture and beat just until a few streaks remain. Add half of the strawberry puree and beat to combine. Then, add another third of the flour and beat just until a few streaks remain. Add the last half of the strawberry puree and beat to combine. Finally, add the remaining flour and beat just until a few streaks remain. 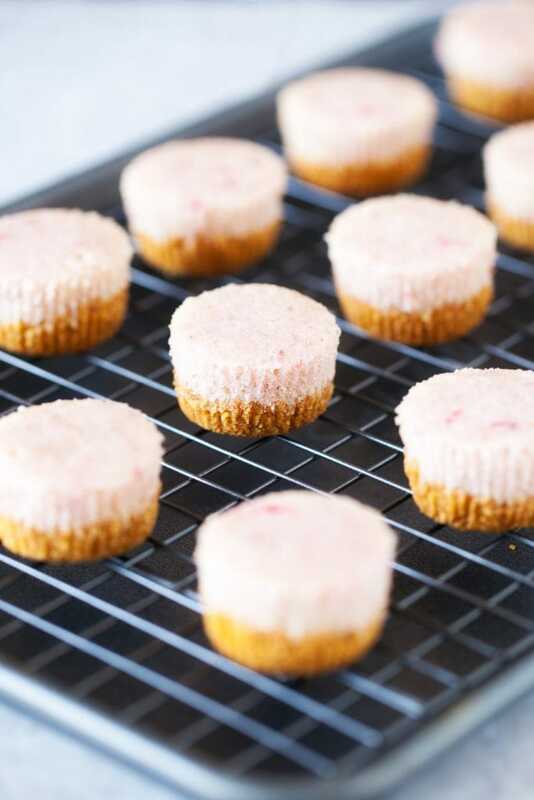 Fill each cupcake well 2/3 full and bake for 15 to 17 minutes, until a toothpick inserted comes out clean. Let cool in the pan for 10 minutes. Transfer to a cooling rack to cool completely. Gently remove the cupcakes from the liners and pipe with cream cheese frosting. 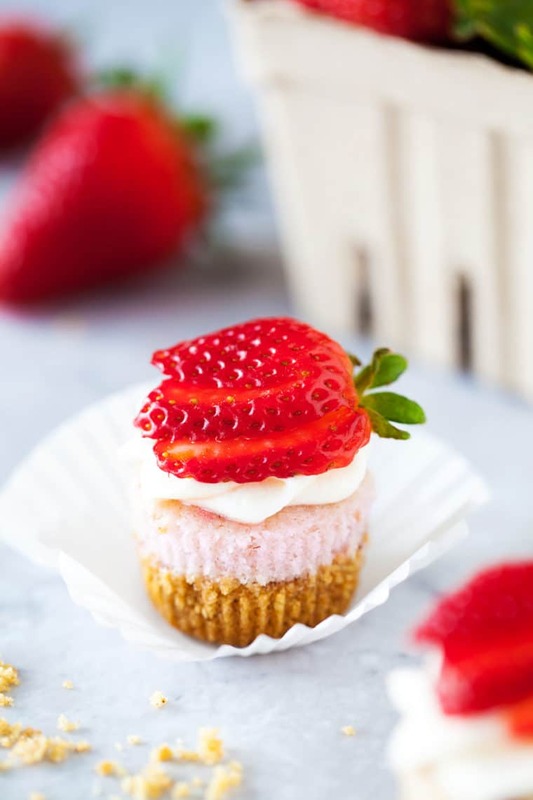 Garnish with fresh strawberries. In the bowl of a stand mixer fitted with the paddle attachment, beat together the cream cheese and butter on medium-high speed until creamy. Add the vanilla and mix until combined. Reduce the speed to medium-low and add the sugar in small batches, allowing to combine before adding more. Next, scrape down the sides, as necessary. Once all the sugar has been added, increase the speed to medium-high and beat until fluffy. 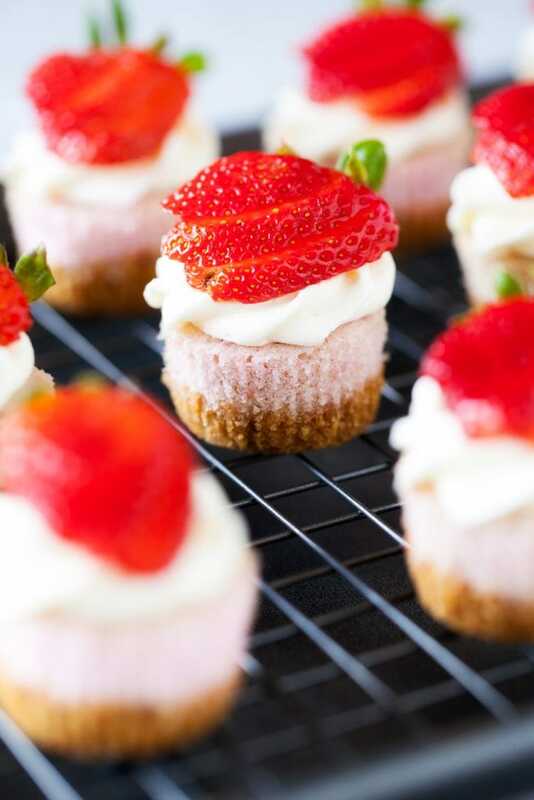 Want more recipes like these Strawberry Cheesecake Mini Cupcakes? Be sure to snag yourself the Sprinkles Baking Book! It gave us so much inspiration. You won’t be disappointed!